The cast of Stranger Things aren’t limited to just acting; some of the actors also dabble in music. Probably the most well-known is Finn Wolfhard, who plays Mike Wheeling in the show. He is the front man of the band Calpurnia. They have been covering music from artists like the Pixies, Weezer, Twin Peaks and The Velvet Underground since they signed to Royal Mountain Records in November 2017. “Through a chance meeting on the set of a music video shoot, Finn and drummer Malcolm Craig hit it off immediately”, Calpurnia’s website says. Ayla Tesler-Mabe and Jack Anderson joined the band soon after. 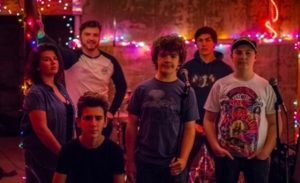 Gaten Matarazzo, who plays Dustin Henderson in Stranger Things, is also in a band, alongside his sister Sabrina. The six-piece New Jersey band is called Work in Progress and has covered musicians like Pearl Jam at live shows. You can find them on Instagram @work_in_progress_band. Photo from Coup De Main Magazine. The next talented actor on the set of Stranger Things is Charlie Heaton, who plays Jonathan Byers. He joined a British Noise Rock Band called Comanechi when he was a teenager and toured with them for over a year but traded his drumsticks for scripts when he started making his way into acting. You can listen to Comanechi’s song “Love Is The Cure” here. Rounding out the list is Joe Keery, better known as his Stranger Things character: babysitter-slash-mother Steve Harrington. When he isn’t protecting the youngins, he is a guitarist in a synth-heavy psych-rock band called Post Animal. And an honorable mention goes to Millie Bobby Brown, who is not in a band but has no problem coming on your late night show to bust out a rap or two. Watch her performance here: here. Header photo from Brooklyn Vegan.